borrowed heaven: Everything Pink & Green: Masters-Inspired Giveaway! Everything Pink & Green: Masters-Inspired Giveaway! Happy Friday, friends! I'm so excited to partner with Piqued PR and some of their amazing clients today to share a fun pink and green giveaway with all of you! Thank you to Lisi Lerch, Shelby Dillon Studio, Blue Foo Design, and Crab & Cleek for all of the amazing items being given away this weekend! 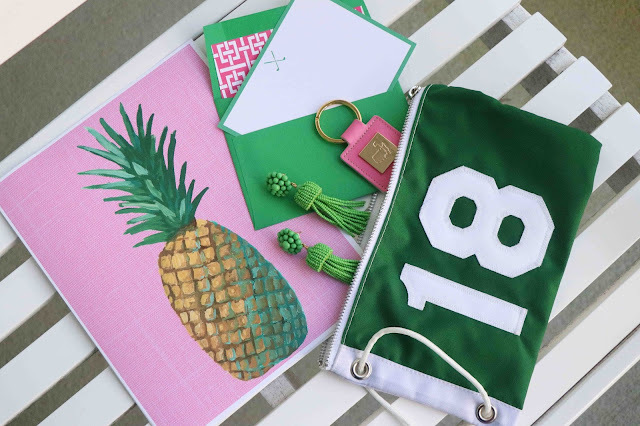 Even if you're not a golf fan, you will love this giveaway - it's everything pretty and girly you can imagine - perfect for spring! 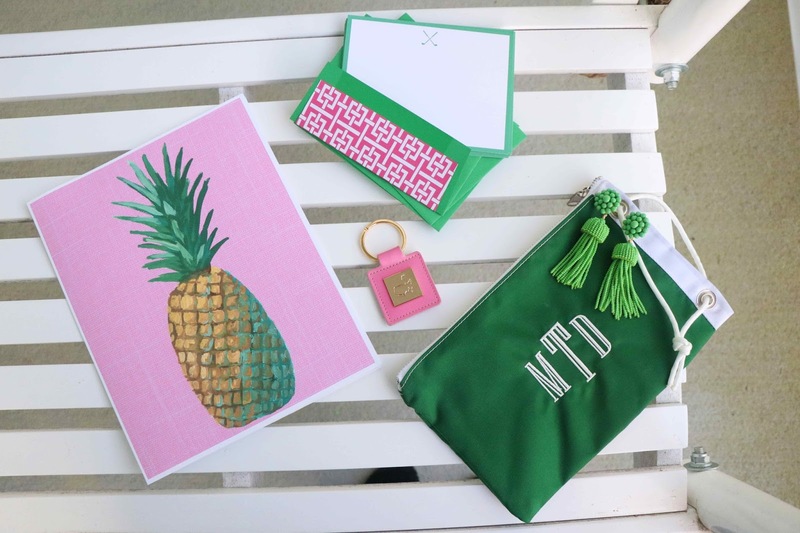 Plus, if you are a golf fan, Mike and I snuck off to the Masters yesterday, so I brought back a little something to add, a cute pink leather key fob! And don't forget, if you're watching the Masters Tournament this weekend, you can get a little party inspiration from my: Five Ideas For Hosting a Masters Viewing Party, recipe for Peach Ice Cream Sandwiches, and the perfect, festive DIY! 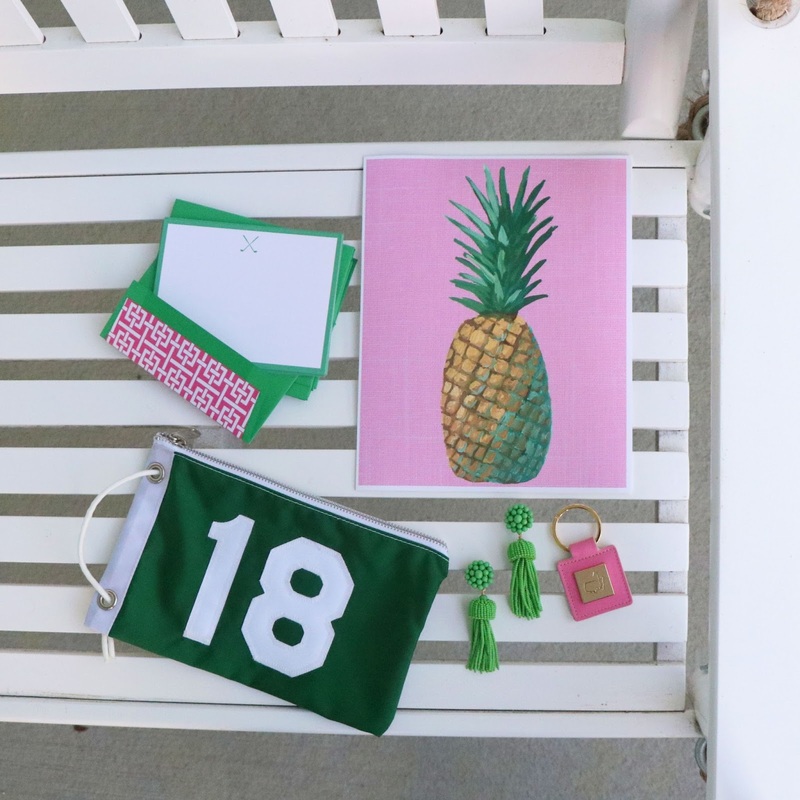 - Monogrammed wristlet from Crab & Cleek's Flagstick collection - made from an actual pin flag! You can enter the giveaway using the Rafflecopter widget below and earn more entries by heading to my Instagram page (click here). The giveaway will run through Tuesday (4/10/18) at midnight, and the winner will be announced on Tuesday evening. Good luck! I am in LOVE with the tassel earrings in Grass color. I would wear these everyday of spring if I win them! I love the Riley Ear Candy necklace on the Lisi Lerch website! I love so many things from Lisi Lerch... if I had to pick, I'd want the tassel earrings in turquoise or the Ginger earrings in gold! That anchors away tote at crab and cleek has this Delta gamma's name on it! I am currently crushing on the Carolina Blue Izzy Gameday earrings from Lisi Lerch. Perfect for football games in the fall. Love all the Pink and Green!! The pineapple print is so cute and of course the earrings!! Love this giveaway - it’s so fun!!! Each item is so cute!! I especially love the Lisi Lerch! Awesome giveaway! Oh I saw the Scottie Dog bag on the Crab * Cleek site and feel in love. Growing up my family had the sweetest dog that looked just like the don on the bag. Such a fun giveaway! Always such a fun weekend each year! Love everything Lisi Lerch, especially gold tassels. The ginger jar tote from crab & cleek is so great! 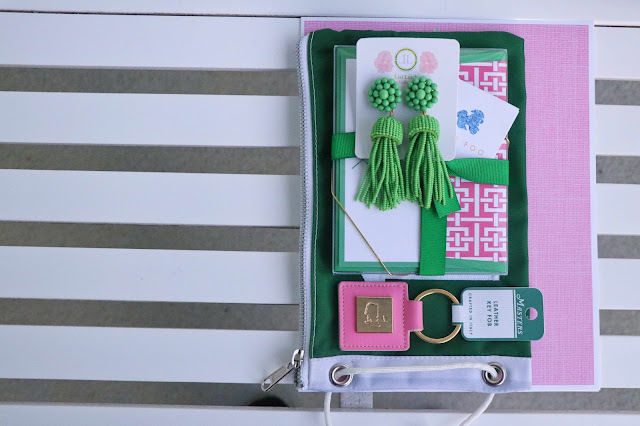 Love the palm print tray from Shelby Dillion and the chinoiserie notecards from blue foo!